In the mid 1940’s Robert Moore founded Moore equipment, a small machine and fabrication shop based out of Moore’s garage. 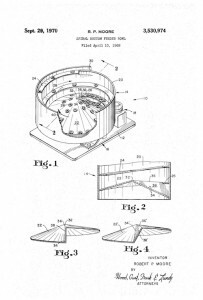 A decade later, Moore invented the Heli-Arc welding process and perfected the vibratory feeder bowl from the design originally patented by Mario Sgriccia in the 1950’s, to the common design still in use today. During the 1950’s Moore Equipment became Moorfeed Corporation, and over the decades grew to become the premier manufacturer of parts feeding and handling equipment. In the 1960’s Moorfeed expanded its operations to California creating Moorfeed West. In 1975 Robert Moore passed away, leaving the company under new ownership. The 1980’s and 1990’s saw continual growth with the addition of Moorfeed South in Florida. Even in the face of new industry competition, Moorfeed continued to grow and became the largest feeder bowl company in the world, employing over 140 people. Starting in the early 2000’s the company fell under hard times and began to lose much of its prominence as the premier vibratory feeder company, with ownership changing hands again in 2003. By the 2010’s the company was struggling and on the verge of bankruptcy. Around this same time, Executive Management Services, Inc., a national facility management and janitorial company, formed Executive Automation Systems, becoming the Manufacturing Branch for the company. In September 2011, Moorfeed Corporation was purchased by Executive Automation Systems. From the very beginning, the goal was to revive the Moorfeed name to its once former glory. Starting with a handful of fabricators and an 8,000 square foot production facility, Moorfeed has already grown to 30+ employees and more than doubled the production square footage and we are still growing today. With Customers on 6 continents Moorfeed continues to be a major player in the industry. With a focus on quality products, after the sale service, innovation, and customer relationships, the “revived” Moorfeed Corporation is breathing new life into the parts feeding and handling industry. Standing alongside Executive Management Services Inc, and its subsidiaries, Barrett Supplies and Equipment, Delta Security, and Maple Creek Golf and Country Club. Moorfeed Corporation has the support and experience to service our customers today and well into the future. Almost every feeder company can trace its roots back to Moorfeed. 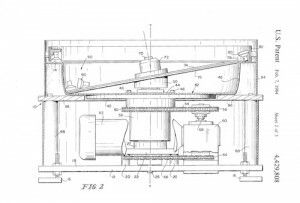 Moorfeed currently holds several patents for products in the feeding and automation industry. Most drive unit and system designs are variations on Moorfeed products. Moorfeed is one the few companies to manufacture its own centrifugals, conveyors, and elevators. Moorfeed has built over 50,000 feeder systems in its history. Moorfeed has successfully delivered 5,000 parts per minute in a system. Moorfeed has successfully fed 135 different parts from one bowl. Moorfeed has successfully fed 21 lines from one bowl.